Col. (Res.) 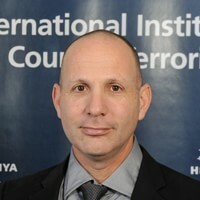 Dakar Eilat served in the Israeli security forces for 25 years in different capacities including, Team Commander in the Undercover Unit in the Israel Border Police, Intelligence Officer in the Police National H.R.T. Unit and Commander of the "Masada" Unit in the Israel Prison Services. He served as Commander of the "Hdarim" Prison and the "Gilboa" Prison. Col. (Res.) Eilat received a M.A. in Political Science from the University of Haifa and a M.A. in Middle East Studies and the Arab World from Tel Aviv University and Specialized in dealing with the prevention of terrorism and Muslim radicalism outside and inside prisons. He serves as a Research Associate at the I.D.F. National Defense College and is a Research Associate at the International Institute for Counter-Terrorism (ICT), at IDC Herzlya. This paper of Col (Ret.) Dakar Eilat received the runner up prize in the 2013 Eyal Ragunis Memorial Competition.